I had to pop into Poundland today, to pick up a load of bits for the First Aid box at the Brownie sleepover this weekend. What joy that will be. Anyway, as I was in Poundland I figured that it would be rude not to have a rummage through the makeup section and to see what branded bargains they had today. Needless to say, I picked up a few bits! Apart from the Babylips, these are all NYC products so whilst they’re not too expensive anyway, it’s still blooming good to get them all for just ONE of your English pounds each. They were packaged in the typical Poundland clear bags, and whilst there were some products on offer together I got a load of single things. There was a lot there today, from Barry M and Rimmel to Hard Candy and Calvin Klein, but these were the bits that tickled my fancy. I picked up two of the Maybelline Babylips balms, in Cherry Velvet and Mango Pie. I think I already HAD Cherry Velvet, but I really don’t mind having duplicates because it’s lovely. I wouldn’t pay full price for these- after all, they are just lipbalms- but finding them so regularly in Poundland is definitely one heck of a bargain. 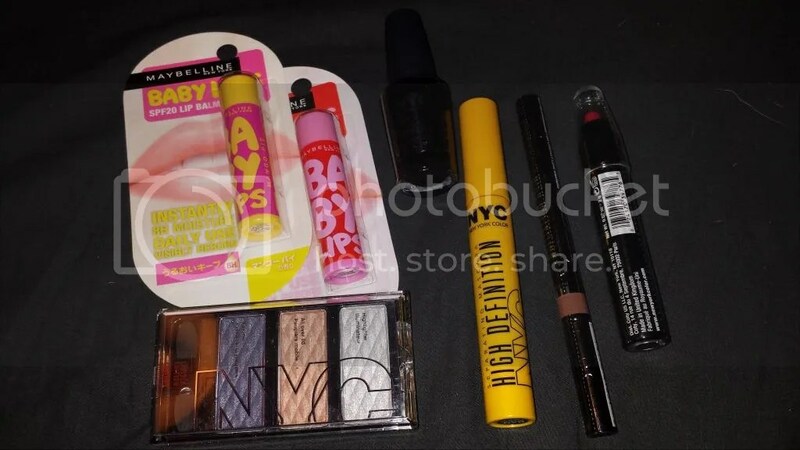 I then picked up an NYC eyeshadow trio in Feelin’ Fab, a nail varnish in Evil, High Definition Mascara in Extreme Black, a High Definition Liquid Eyeliner in Dance Diva (I think) and a glossy lip crayon, I can’t remember the shade but I gave it to my mum so can’t check- more on that later! This is the eyeshadow trio swatched quickly and I have to say it’s not bad. 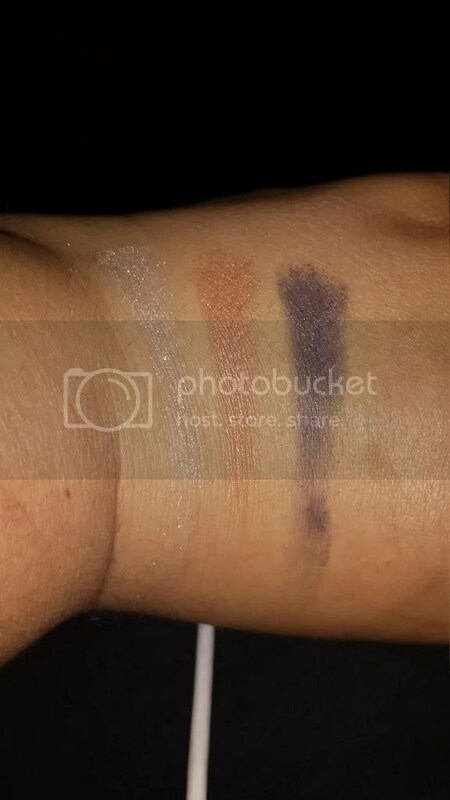 The silvery highlight shade isn’t greatly pigmented- even less so once it’s on the eyes- but the other two are pretty good! There’s also no real fallout and a fairly smooth texture, so I’m quite impressed considering this cost me a quid. Here we have the liquid liner and the gloss crayon. I didn’t realise I’d picked up a brown colour, but figure it may come in handy for day time and it’s not a bad product. It’s much harder to apply to the actual eye, though, so the jury’s still out on that one. 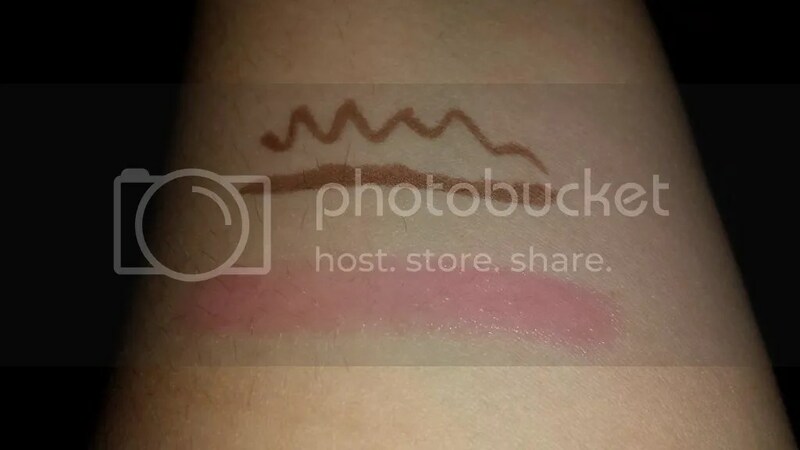 In this swatch, the gloss crayon looks like a lovely, sheer and glossy pinkish colour and I was so pleased to try it out on my lips because it looks like such a perfect summer shade. Alas! 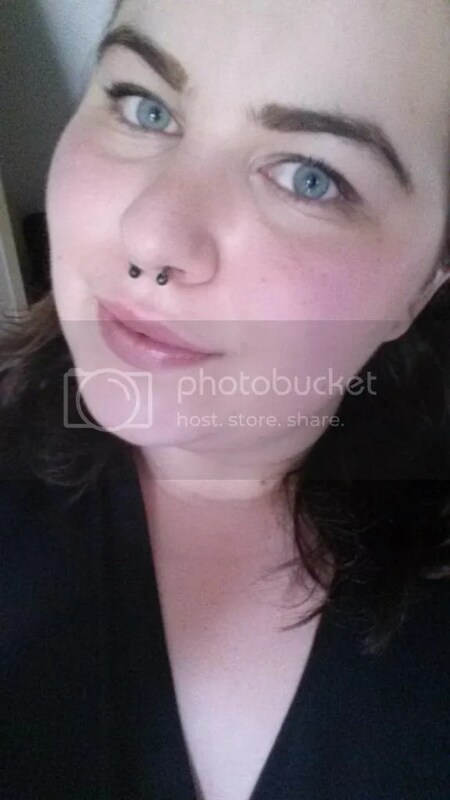 Once on the lips there was no pigmentation whatsoever! I have donated it to my mum because she hates lipsticks or lip colours that are dark so even if she uses it as just a super sheer wash of gloss she’ll have more use out of it than I would. The mascara looks really interesting, with a super small plastic bristled brush- not too dissimilar to my Collection No Clumps mascara wand. 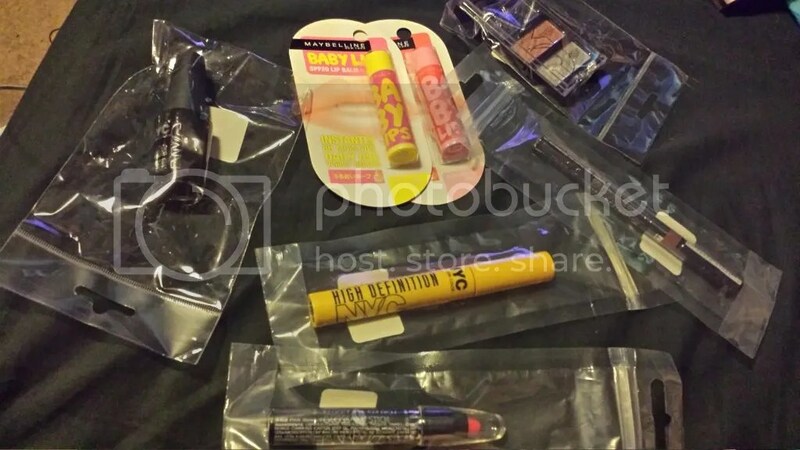 Once I’ve used up one of my open mascaras I’ll let you know when I try it! 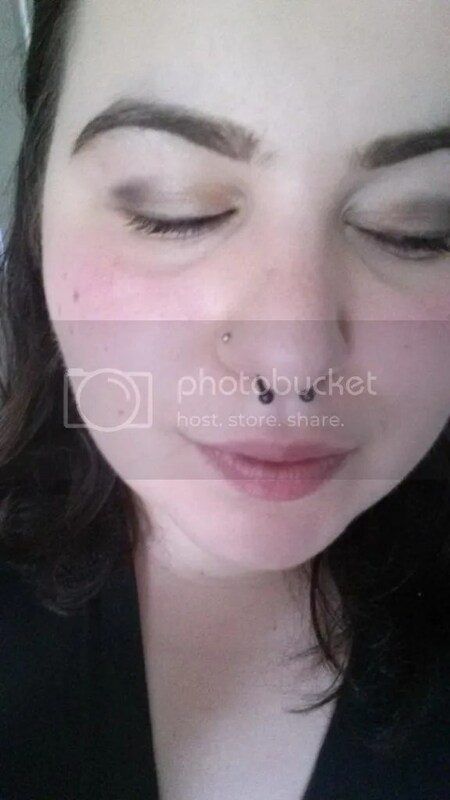 Here’s a quick makeup look I did for work today, using the liner and eyeshadow. I SO can’t wait to get my eyebrows seen to! How nice are the eyeshadows!? MUCH more pigmented than I was expecting! The MUA Power Brow is a new-ish product too, I haven’t been joking when I’ve been talking about my new obsession with my brows recently. So far I’m very impressed, especially with the highlighting end, and it’s not as red-toned as I was expecting it to be. There was a beauty casualty today, folks. The NYC foundation went in the bin. It’s one of the worst I have ever used, it was caking as I blended it, so even though I tried to buff it in it just didn’t work. I kept it on to be a trooper but after about twenty minutes it had disappeared from my T-zone and caked everywhere else. Not impressed, so glad it wasn’t expensive. 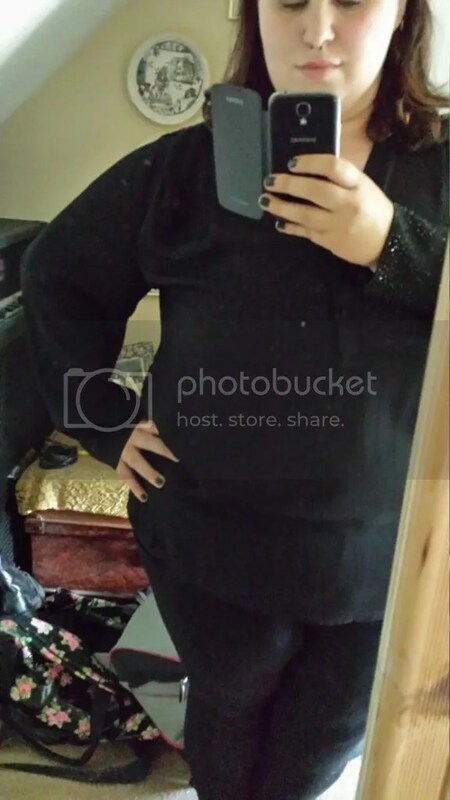 This is what I wore to work today. The top is a beautiful blouse I got for a ridiculously discounted price in a Monsoon sale- I LOVE Monsoon but can only really shop there when things are on sale!- and because of the way the sleeves billow out but then gather into lovely, bejewelled cuffs it makes me feel like Jareth the Goblin King from Labyrinth. And as that is one of my favourite films of all time, that’s never a bad thing. 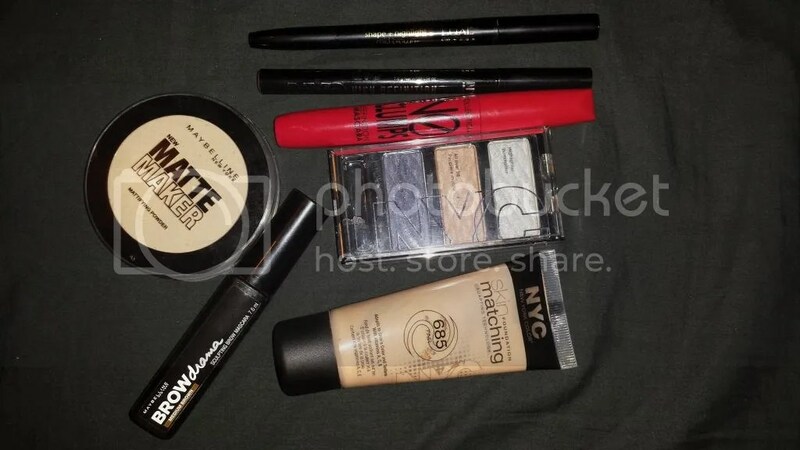 This entry was posted in Beauty, Hair, Makeup, Daily Look, Fashion- High Street and tagged Babylips, Collection, daily face, daily look, makeup, Maybelline, Monsoon, MUA, New York Colour, NYC, Poundland. Bookmark the permalink.